We ship a couple times a week and will do our best to ship to get your playa staples to you within 3 weeks (often faster). If you need the faster please send an email to info@ironmonkeyarts.org and we can ship sooner. ALL PLAYA STAPLES will be shipped by Aug 15th. We will email you once your staples are ready for pickup with options. The Shop is in Georgetown (south of Seattle) and I will also give people the option to pick them up at my home off the porch in the Columbia City Area. If you have any questions or concerns you are always welcome to email us. 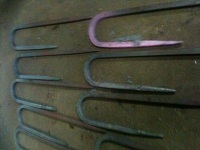 Playa Staples are hand-forged, square stock steel tapered to points at each end and bent into a 'candy cane' shape. When hammered into the ground they lay flush with the playa and will not trip or skewer people, like that unsafe rebar stuff. They enter the playa easily and stay secure until it's time to go. Playa Staples are removed quickly and simply by levering them straight up. They've been around since 2003 and are time tested and burner approved.